Museums, galleries, private collectors and orchestras frequently call upon the specialist services of Royal De Gruijter and Co. One of our regular customers is the Royal Concertgebouw Orchestra, acknowledged to be among the finest in the world. No two customers have precisely the same requirements, but all demand that their artworks or instruments are handled with the greatest possible care and attention. This calls for a special approach within our organization. Arranging the logistics for this type of transport is an art in itself. It calls for expertise in several specialist disciplines, from packing to transport, from insurance to customs formalities, and from storage to conservation. Installing artworks at their destination calls for yet another form of specialist knowledge. It takes many years to develop the necessary expertise in these areas. Royal De Gruijter & Co. has done so through close collaboration with our customers and with our extensive national and international network. Our staff are specially trained to handle unusual and valuable objects. They always wear protective gloves, for example. They know precisely what type of protective packaging an artwork or instrument requires, which will depend in part on how it is to be transported (road, rail or air) and how long its journey will take. All items are transported in climate-controlled conditions at all times, even when going to the other side of the world. The latest track-and-trace systems allow you to monitor your consignment’s location at any given moment. "From the initial contact until finalizing the move we guarantee personal attention and an excellent execution"
Royal De Gruijter & Co, is an international moving company that strives to offer excellence in all aspects of its service. We attach great importance to quality, in keeping with the obligations that our ‘royal’ title brings. Our customers are assured of a personal service, provided by staff who are driven by a passion for their profession and maintain the very highest level of integrity. Any move is a very critical part of our own life, surely when our long-distance moves occur across countries and we have to deal with particular furniture. Therefore I was thinking carefully about the best choice possible for moving, we will never have a second chance. After some web surfing, I encountered among others the Royal Dutch Movers De Gruijter & Co. I had to arrange a long moving from the middle of The Netherlands down to the southest part of Italy and I contacted four Dutch movers. Three visited my home and examined my furniture and listened to my wishes. I noticed immediately how differently Royal De Gruijter & Co looked at my furniture, as they didn’t care so much about the volume but about the kind of furniture (glass, paintings, antiquaria). 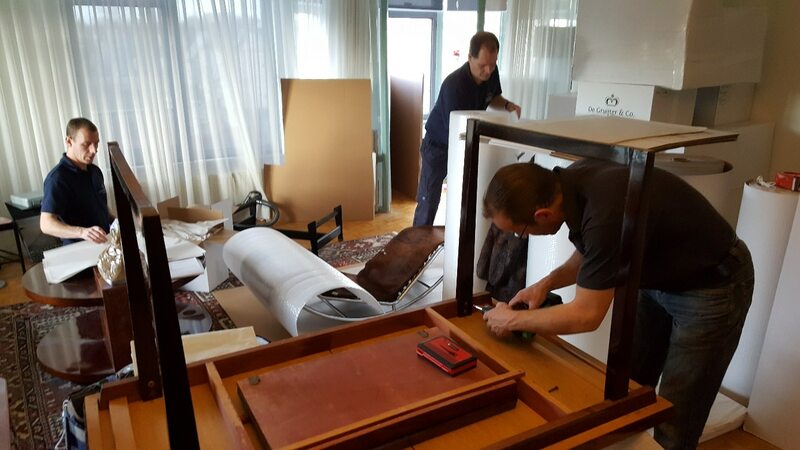 In contrast to the other movers, Royal De Gruijter & Co came with different options for a safe transportation, ranging from the kind of ferry up to the external elevators to bring all the furniture into my new home. Now it was simply up to me. A choice that was now rather simple, as the other movers came with comparable prices. The difference at that moment was the quality of the move, but to make it even more easy, Royal De Gruijter & Co provided even a gorgeous warranty and they would pack and unpack all my stuff, both in my old house as in my new home. They came and packed carefully all my household goods. I only had to tell them into which new room in Italy they had to unpack my stuff. The packing was highly impressive, I had simply nothing else to do than to look with surprise and admiration. One week later, they arrived exactly at the hour they wrote in our contract (but they kept me updated by emails). Royal De Gruijter & Co unpacked my furniture in the right new rooms and without any damage. When I asked for feedback I was touched by the commitment and evident experience of those working there. And one of the nicest things was just to meet again below my new home the same guys who packed so carefully my furniture in The Netherlands. Again, something like this happens only once and I cannot do anything else than be very grateful to Royal De Gruijter & Co for the offered (and provided!) service and I strongly recommend them hereby for any international move. And thank you all! Best choice possible for moving! Koninklijke De Gruijter & Co.